The Mines and Geosciences Bureau Regional Office No. XIII bagged the third place in the 12th Inter-Agency/LGU Statistics Quiz on October 30, 2018 at the Balanghai Hotel and Convention Center in Butuan City. The quiz highlighted the Closing Ceremony of the 29th National Statistics Month Celebration with the theme Exploring Philippine Wonders in Numbers: Statistics Towards Sustainable Tourism Development. By virtue of Presidential Proclamation No. 647, the month of October every year was declared as the National Statistics Month. 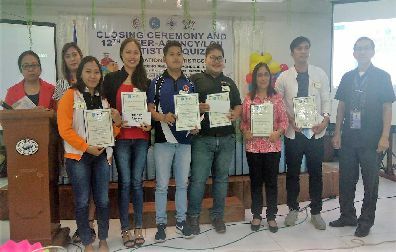 The said event was spearheaded by the Philippine Statistics Authority (PSA) Region XIII in partnership with the Bangko Sentral ng Pilipinas (BSP) Butuan Branch, National Economic and Development Authority (NEDA) Region XIII, and Caraga Regional Statistics Committee. It was participated by representatives from various National Government Agencies, Local Government Units and academic institutions. The Department of Budget and Management (DBM), Department of Education (DepEd), Department of Social Welfare and Development, Butuan City Water District, Provincial Planning and Development Office of the Province of Agusan del Norte, Cooperative Development Authority, Department of Health, Bureau of Internal Revenue, Philippine National Police, Caraga State University, Department of Environment and Natural Resources Regional Office No. XIII, and Mines and Geosciences Bureau (MGB) Regional Office No. XIII took part in the event. The quiz was divided into three parts – Round 1, Round 2, and Round 3. Each of these rounds consisted of 10 questions collected from the different government agencies and LGUs pertaining to the statistical data of Caraga Region. For Round 1, each question has a corresponding point of one with a time limit of 3 seconds. On the same note, Rounds 2 and 3 have corresponding points of three and five, respectively, with time limit varying from 3 to 15 seconds depending on the question. During the quiz proper, the quiz masters read the questions and the choices twice. In between each round, trivia questions were given to ease and relax the minds of the participants as well as entertain the other attendees and guests. The Board of Panelists, who at the same time served as judges during the quiz, comprised Engr. Emmanuel Z. Gidacan, Chief of Project Development, Investment Programming and Budget Division of NEDA Region XIII; Mr. Marlone D. Alejado, Acting Manager of BSP Butuan Branch; and Dr. Rosalinda C. Apura, Regional Director of PSA Region XIII. After completing the three rounds and with the confirmation of the board of panelists, the DBM was declared and awarded the first place. In the same way, the DepEd and MGB RXIII were awarded the second place and the third place, respectively. Mses. Ivee Drea Canoy Zerda and Glynis Irene S. Buot represented MGB RXIII in the quiz. The event concluded with a message from Dr. Apura in which she congratulated and thanked all the participating agencies and LGUs for the success of the activity. She also acknowledged the cooperation of each agency in the submission of its corresponding statistical data inputted in the PSA’s statistical database which is relevant in upgrading the quality and standards of statistics in the country.